Tarot cards elicit a range of emotions from curiosity to fear. Some use them as a tool for spiritual discernment. Others view them as archetypes of human personality that help us to see ourselves more clearly. Some see them as a source of entertainment. Others lump them together with Ouija boards and avoid them at all costs. Not surprisingly, I fall into camps one and two. Yes, I’ve read the few Bible verses that speak against against divination, but how many Christians have asked God to send them a “sign” to help them make an important decision. If that’s not divination, I don’t know what is! 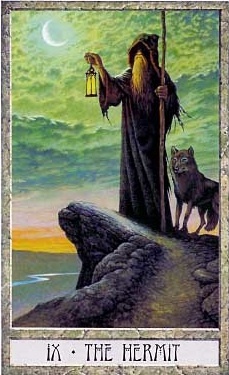 It’s also the way the Tarot cards work as we ask the Holy One to give us wisdom and insight. The beauty of the Tarot is that it can be seen as either Spirit-guided or random choice. Either way, it works. (Although I believe a reading by a spiritually grounded and centered person is always more effective!) One of the reasons for this is that Tarot cards help us to explore our inner and outer nature with rich vivid imagery. The MAJOR ARCANA cards represent the inner journey of the soul. The MINOR ARCANA cards represent the outer journey through the Wheel of the Year and the themes which accompany it. The COURT CARDS represent personality types the soul can use to function in the outer world. Christians may find it interesting that the traditional Ryder-Waite deck is loaded with Christian imagery. This is especially true of the MAJOR ARCANA CARDS. My goal will be to make my way through the deck, looking at both the Christian and Pagan interpretations of the cards. I hope to dispel people’s fears of these cards whose wisdom has benefited both Christians and Pagans for many years. As a side note, I subscribe to the belief that there is not one “correct” way to read the cards. Since human intuition is involved in interpreting them, they speak to people in many diverse ways. Furthermore, there are TONS of decks out there and it’s important to find the one that works for you. Christians will definitely be drawn the the traditional Ryder-Waite deck but I also use the DruidCraft deck by Philip and Stephanie Carr-Gomm. The illustrations on the DruidCraft cards are absolutely gorgeous and speak for themselves. It is a deck based on Druid and Wiccan elements so an understanding of these is essential if you’re going to use the deck. This entry was posted in Tarot and tagged Pagan, Spirituality, Tarot, Wicca. Bookmark the permalink.